Josie Schuller is back and she's in business for herself. And business has never been better. Now in Florida, Josie is keeping up appearances as the doting wife and loving mother while she peddles Tupperware and hammers home a sale or two. Joelle Jones' housewife-assassin has returned for a second limited series of bloody violent dark comedy. It's been some months since the Schullers left Seattle and relocated to another suburban neighborhood this time in the Sunshine State. Josie leaves behind a trail of bodies and an agency that felt her idyllic home life was getting in the way of her job. She severed ties, literally, with her handler and now enjoys the warm weather, the lush scenery, and contract killing on her own terms. Jones continues to balance the societal constraints of a woman in the 60's by subverting them with her secret life as an assassin for hire. The opening sequence is in keeping with the first volume where Josie goes undercover to get close to her target. It's a slow burn before things escalate quickly and suddenly it's Mad Men as directed by Quentin Tarantino. Jones' execution in unfolding the violence is even better than the first volume. You can see it coming, it's brutal and disturbing but tempered with Josie's matter-of-fact entrepreneurial burden of cleaning up her mess. Meanwhile, back at the Schuller residence Josie struggles to keep up with errands while also trying to keep a lid on mother-in-law Mama Schuller. She knows Josie is leading a double-life and wants to expose her. Gene's creepy obnoxious boss comes over for dinner. On top of that, Josie's relocation may not be as safe as she once thought. Jones has constructed a straightforward story with enough subtle twists to keep things intriguing when Josie isn't driving a hammer into someone's skull. I can't help but be a little bias because I'm a huge fan of Jones' art. Her characters are so sharply designed from facial expressions to the fashions they wear. Especially, in a period piece like this, there's so much detail in virtually every panel, that there's no confusion to what era it is. From awful wallpaper to the cars of the sixties, a lot of thought has gone in making the setting appropriate. Jones is doing extraordinary work with telling the story with her visuals. Michelle Madsen provides some great colors that mimic the tone of each scene. A serene drive or a peaceful day in the suburbs are layered in bright but subdued hues. A gaudy home of elderly sisters washed out in pinks and violets with rose-colored wallpaper. And no shortage of shocking red. Madsen adds an exclamation point to the story. 'Lady Killer 2' is the best dark comedy in comics that skewers the patriarchy of the past with a killer woman in Josie Schuller. It's not just a compelling story but arguably one of the best-illustrated comics as well. You need to add this to your pull list. 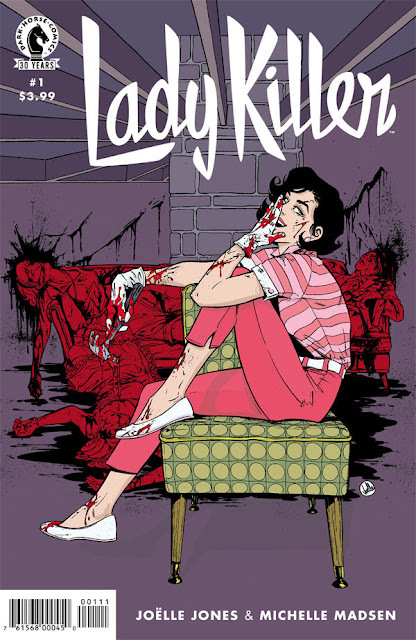 'Lady Killer' if off to another strong start.